Our Starr leads a very active life. She has swimming class 3 times a week, takes a music class and a play and share class at a local family center and takes a gymnastics class once a week. Since Marc and I are both fortunate enough to be able to share child care duties due to our flexible work schedules we try to enrich Katie's life with some fun activities during the week. Katie is very active and super athletic and loves her gymnastics class very much. The directors tell us that she has a great deal of natural athletic ability but most of all she just plain ol' loves it!! Today was show day so family and friends could come watch. The children were able to show off their newly honed skills. Katie had a ball and then received a medal. Boy did she love that. When she received her medal she jumped up on the podium and yelled TaaaaaaDaaaaaa and threw up her hands!! What a ham bone..LOL Here are a few cute pics from her class; enjoy! ......that we are DTC for Ethan!!!!! That means that our dossier is winging it's way to China. Now we pray for a quick Log in date and then the wait begins. It is taking about 90 - 120 days from the time that your dossier is sent to China to receive your LOA (Letter of Acceptance) and then another 3-4 weeks for TA (Travel Approval). We hope to travel in the fall. We are very happy to be one step closer to our son. I had an fun and relaxing weekend and there were no children involved; that is where the relaxing part came in. My sister was in Florida for business so on Friday I took the 3 hour drive to where she was staying to spend the night with her. My doll of a husband took care of our girl. My sister Jane who is awesome fun was at a convention and many of her co workers and associates who are also friends joined us for the evening. They also know how to have a good time so needless to say we had a blast!! I came home the following day and regrouped as Marc and I were going away to a resort in Marco Island on Sunday morning. This was a birthday gift from Marc and Justin as Justin said he would take two days off of work to watch Katie Starr for us and Marc made all of the plans at the resort for us and scheduled a spa day for me. We had so much fun just being a couple which we have not done in the year that we have been back from China. We ate, drank, went to the beach, went to the spa and slept...heaven!! Katie did beautifully with her big brother and saw her Nana and Papa as well so she hardly missed us. When we got home though she was beyond thrilled and we had a wonderful reunion with her. A huge thank you to the men in my life for providing such a wonderful weekend. I love you both so very much! Here is a fun video from just before we left. It is Katie's impersonation of a lion. She kinda looks like the cowardly lion from the Wizard of Oz...too funny!! Last year on this day we received a sleeping Katie Starr. We could not wake her up in the meeting room where she was handed to us and she would not wake up until much later in our hotel room. At first she was bewildered, then terrified and finally despondent. It is no secret that our first months with Katie were quite challenging indeed. It took a long time to win our sweet girl's trust as she had been in a very loving foster home for most of her first year of life. The first picture was the only one that we got of her awake that day. Now, one year later take a look at the joy in our Starr's face in the second picture as she celebrates with her Papa (Grandfather) at our one year "forever in our arms day" celebration this evening. We have come so far and we are so thankful for our Katie Starr!! Mother's Day has always been a very special day in our family as I know it is in each of yours but Mother's Day 2006 was made that much more special in our family by the addition of Katie Starr into our lives. When we celebrate the holiday this year we will also be marking one year since our "forever in our arms day." I will never forget that day. It is just as indelibly etched into my memory as the birth of my son. I have been a mom for over 22 years and quite simply it is the role in life that I love the most. I love being a mom to my adult son Justin who I now call friend and I love being a mom to my very 2 year old Katie who has quite simply rocked all of our worlds to the core in the best way possible. 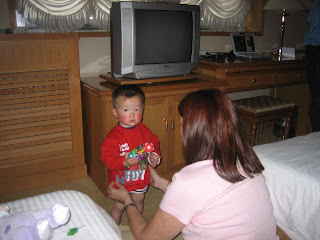 I long to mother my son to be, Ethan, who needs my mothering so very much. Happy Mother's day from our home to yours and of course a huge happy Mother's Day to the waiting mommies; your child is out there and destiny will ultimately unite you. You are already mommies and it is just a matter of time before your child is in your arms. We cannot wait to celebrate that day with you. 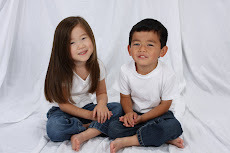 Lori - Mommy to Justin Bennett, Katie Starr Hongshan and Ethan Frederick Zhiqing; still in China - we love you Ethan!! Miss Katie is on the mend and is doing much better than she was 2 days ago. The men in her life on the other hand cannot say the same. Last evening after falling asleep I was awakened by the sound of Marc getting out of bed and walking to the bathroom. Marc never leaves our bed to go to the bathroom (I cannot say the same for myself :) so I knew that something was wrong. I got up after a few minutes and knocked on the door and did not hear anything. I walked in and found him laying on the floor. He was so sick that he could not even make it back to the bed. I helped him up and as we were walking back to the bed I heard the sound of retching from the other bathroom down the hall. Both of my guys were sick as dogs :( This went on all night and I mean all night. I was back and forth between them and checking on Katie the entire night. It was horrible!!! Now it is 10:00 PM almost 24 hours later and Marc is on the mend but Justin is still very sick. Please send out all of your good thoughts and energy if you will so that we have a calmer evening than last night and that he gets some rest. All they could say today was that they could not believe that little girl could make them sick enough to bring them to their knees. After having raised the world's pickiest eater; my son Justin (sorry J it is the truth!) it has been absolutely wonderful to have a child that totally enjoys eating. Katie loves to eat a wide variety of things and will at least try everything that we give her. I knew immediately when she would not eat breakfast (not even a bite) that something was wrong. Mommy is always right! We cleaned it all up and I went to work. Later in the morning Marc called me up and said in a totally serious voice "you must come home now" I asked why and he proceeded to tell me that she had had a "man size case of diarrhea". He had heard a noise and by the time he got to her it was all the way up to her belly button and up her back inside her diaper. He of course said that he was kidding about me coming home and that he could handle everything quite fine. By the time that I came home she had been having a-- blast all afternoon and the crib had been changed once again and she had been bathed three times. Marc looked worn out and so did Katie. Katie Starr still will not eat and is running a temp but thankfully she is drinking like a champ. We called the doctor and she told us that this tummy bug is very prevalent right now. I am sure it is in the same bug family that made our friend Lily so sick this past weekend. She said it should run it's course in a 24-48 hour period. Told you something was rotten in Denmark or should I say South Florida. Cinderella ain't got nothing on our Starr!! Katie is our little helper. She loves to help whether you want her to or not. Last night she decided that she wanted to sweep the front walk and the driveway and of course was cute as a button doing it.